Our stock contains the highest standard of rare and unusual items for the collector. 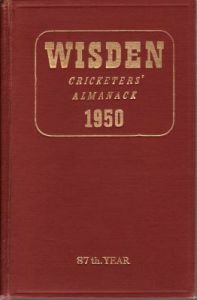 Nineteenth century cricket rarities, tour books and elusive overseas cricket annuals are typically featured. We particularly specialise in books associated with famous collectors of the past – we bought the entire collections of E W Swanton and Gerald Brodribb and regularly offer items from the libraries of J W Goldman, John Arlott, G Neville Weston and others. We were privileged to sell the personal set of early Wisdens formerly belonging to A D Taylor. We also regularly feature autograph material of all types. Since 1989 Boundary Books has been the leading publisher of deluxe Limited Edition cricket books for the collector. During that period we have produced 23 new titles most of which have sold out quickly and are now sought-after collectors items. We are proud to have published and been supported by some notable authors and cricket personalities including John Arlott, E W Swanton, David Gower, David Frith, Graham Gooch, Bill Frindall, Ian Botham, Gerald Brodribb, Sir Michael Marshall, David Rayvern Allen and G A Beldam. With these authors we have always sought to produce genuine new contributions to cricket history and literature rather than simple facsimiles of old titles. This year, to better serve our mail order customers, we have opened a showroom in South Oxfordshire where our entire stock can be browsed by appointment.